I mentioned that I was going away for an extended break, in every sense of the word. We traveled to the remarkable Galapagos Islands, an archipelago of volcanic islands distributed around the equator in the Pacific Ocean some 525 nmi west of continental Ecuador. Before I jump back into things, I hope you will indulge me in the modern day version of a slideshow of my trip — yes, it’s off-topic, but… the Galapagos Islands are a simply remarkable place. And just so it isn’t totally off-topic: There is a U.S. government connection in the Galapagos Islands. When there, I learned that the U.S. constructed a military base on in Baltra island and radar stations in other strategic locations. Baltra was also established as a US Air Force Base. Crews stationed at Baltra patrolled the Pacific for enemy submarines as well as providing protection for the Panama Canal. After the war the facilities were given to the government of Ecuador. Today the island continues as an official Ecuadorian military base. * The Galapagos Islands are primarily protected areas, but there is a sizable population that lives on the islands — about 40,000 or so. There is even an airport on the islands. That puts a remarkable strain on the islands eco-systems. 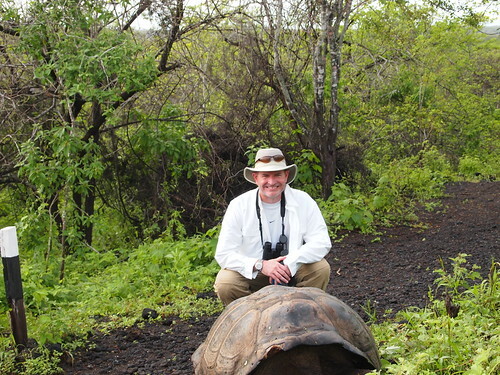 * The Galápagos became a national park in 1959 and tourism started in the 1960s. * The islands are famous because they are geologically young and famed for their vast number of endemic species, which were studied by Charles Darwin during the voyage of the Beagle. His observations and collections contributed to the inception of Darwin’s theory of evolution by natural selection. We spent a week on board the M/Y Grace — named after Grace Kelly, by the way — touring this remarkable place. And this is remarkable because of the topography — it looks pre-historic… because of the eco-systems — there are desert climates with cactus almost adjacent to very lush green lands… and just about everything in between. The location, the weather, the temperatures — and some luck — have make these islands fertile grounds for scores of plants, animals, birds, marine life. There are these remarkable land iguanas, but there are also the even more remarkable sea iguanas, who have evolved to be able to drink salt water. (They almost snort it out.) And they swim using their tails to propel them to the algae that they eat… There are boobys — Red Footed Boobys… and Nazka Boobys… and the Blue Footed Boobys. There are sea lions — and penguins. Yes, the only place where there are penguins outside of Antarctica… There are Frigate birds. The male Frigate birds during mating season puff up what looks to be their chests to attract a mate. When the female Frigate birds fly by, they puff up, spread their wings, and make a sound that is right out of the Jurassic period. We arrived at a good time, it was spring and the male Frigate birds were looking for mates. The males sit in low brush and inflate their bright red pouch at the base of their bill and call for a mate. The bigger the pouch the more attractive the male. If a female is interested she will land nearby and offer him a twig. If he accepts they are a couple and proceed to produce an egg. Zuckerman, who is also a professional photographer, genously agreed to allow me to post some of his photos. They are much better then mine. That being said, if you want to see mine, they are all posted on my Flickr page — you can even see them in a slideshow of your own. You can see the collection here, including my passion for sunsets. I should also note that on the trip, we visited Ecuador’s capital, Quito, which is virtually on the Equator and, at more than 9,000-feet, second-highest administrative capital city in the world (after La Paz, Bolivia), and the highest legal capital (ahead of Sucre, also in Bolivia, and Bogotá, Colombia). 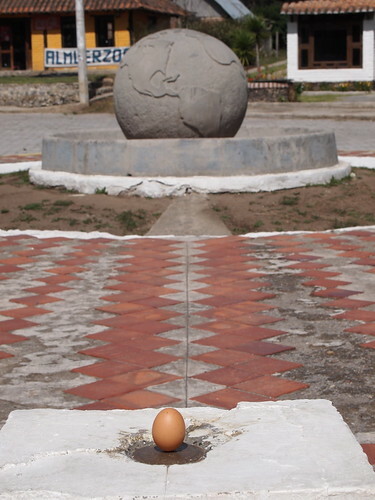 And we got to cross the Equator several times — on the ship, but also on land, where we did the ‘balance the egg on the equator’ experiment. While scientists seem to say it isn’t true, it worked for us. It was a remarkable trip. It was great to be away — great to be un-plugged for a period of time — and… it’s great to be back.